How long before Pakistan falls to Islamic State? Not long. "For 70 years, the ruling elite of Pakistan have accommodated religious fundamentalist demands in the country to either to safeguard their political interests or to keep the existing political power structure intact to sustain their rule. Now, in Pakistan, the credibility and legitimacy of politicians and bureaucrats is measured on the basis of their religious bona fides rather than the kinds of policies they hope to implement." That passage from the following report is so scary you don't want to think about how scary it is. 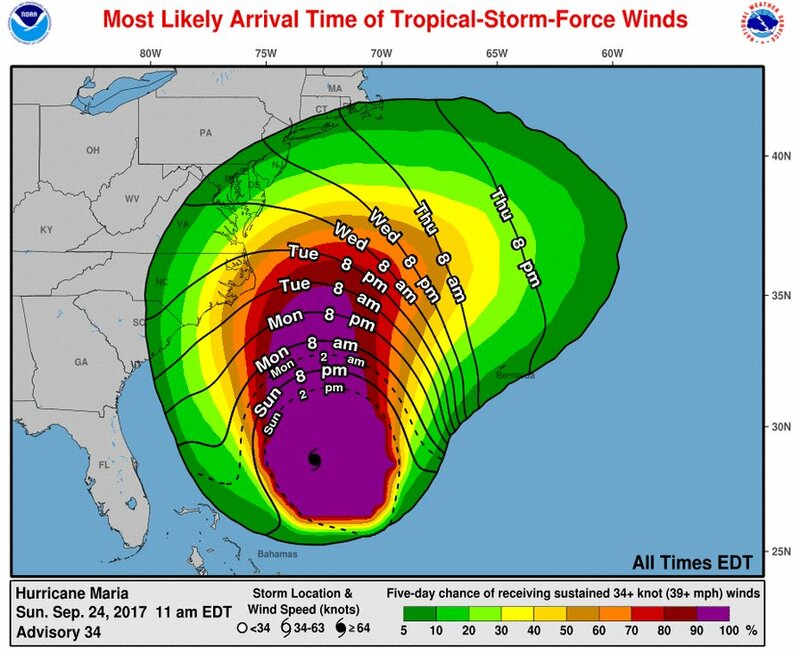 "Hurricane Maria is still churning toward the U.S. East Coast"
The Zombie Hurricane. No matter how much land it's encountered it just won't die. Swells generated by Maria are increasing along portions of the southeastern United States coast and Bermuda and will be increasing along the Mid-Atlantic coast later today," the center said Sunday, warning that such swells can cause "life-threatening surf and rip currents." Can legendary Canadian politeness save the world? "This is Canada," Cote said, adding that "if you remain calm, the bear remains calm; we all can co-exist." The story is reported at Sputnik, which links to the video posted at Facebook of Cote's encounter with the -- um, guests. However, given the large teeth of these guests I think that in addition to politeness it takes a certain je ne sais quoi to pull off Cote's exercise in diplomacy. [brushing aside a cobweb and setting the candle-holder down, as I struggle against the rusted hinges on an aged steamer trunk] Let me see what's in here. [rooting around in the books stacked inside] Hmmm. Shall I try tales from the 10th century, or the story of -- what's the name? Humboldt. Alexander von Humboldt. Never heard of him. I see from more of the review that he was also quite an adventurer -- indeed, a veritable superman. All right, this calls for chocolate chip cookie dough and a glass of milk. The Invention of Nature: Alexander von Humboldt's New World by Andrea Wulf. Part 1 of 4. What a great story! Welcome relief from the day's news! I can't wait for Part 3, which I hope will be aired on Monday night. Across Puerto Rico more than 15,000 people are in shelters, including some 2,000 rescued from the north coastal town of Toa Baja. Many Puerto Ricans planned to head to the mainland to temporarily escape the devastation. In northwest Puerto Rico, people began returning to their homes after a spillway eased pressure on [Guajataca] dam, which had cracked after more than a foot of rain fell in the wake of the hurricane. A dam upstream of the towns of Quebradillas and Isabela in northwest Puerto Rico [Guajataca] was cracked but had not burst by Saturday night as water continued to pour out of rain-swollen Lake Guajataca. Governor [Ricardo Rossello] said there is "significant damage" to the dam and authorities believe it could give way at any moment. "We don't know how long it's going to hold. The integrity of the structure has been compromised in a significant way," Rossello said. CNN: "Two new earthquakes shake southern Mexico ..."
I think that technically at least one of those two quakes, the first one, should be called an aftershock. I don't know about the second. See the Los Angeles Times report Sept 23 - 7:30 PM filed from Mexico City re the first quake yesterday. Two more earthquakes shook southern Mexico on Saturday, further rattling a country still coming to grips with the devastation from stronger temblors earlier this month. A 6.1 magnitude earthquake Saturday morning was centered in Oaxaca state near Matias Romero, a town about 275 miles southeast of Mexico City, the US Geological Survey said. Roughly speaking, the epicenter was between the centers of this month's two more violent earthquakes -- the 7.1 magnitude temblor that hit Tuesday closer to the capital, and the 8.1 magnitude quake that struck September 8 off the southern Pacific coast, near Chiapas state. In Oaxaca, some highways and a bridge that had been damaged during the September 8 earthquake collapsed, Mexico's federal police said. Mexico City did not appear to have sustained significant damage in the earlier and stronger of Saturday's two quakes, said the country's office of the secretary of public security. Warning sirens sounded in Mexico City after the morning quake was detected, interrupting rescue operations at some of the dozens of buildings that collapsed from Tuesday's earthquake. Julia Juarez, 56, sat in a park where the homeless set up tents. "All the help we have received is from the civilian population. The government has not sent anything at all," she said. "No food, no clothes, no water, not even an Alka-Seltzer," she said, referring to the pain relieving medication. Along a 60-foot stretch of a bike lane in Mexico City's downtown, families [displaced by the earthquake] huddled under tarps and donated blankets Friday, awaiting word of loved ones trapped in the four-story-high pile of rubble behind them. "There are moments when you feel like you're breaking down," said Patricia Fernandez Romero, who was waiting for word on the fate of her 27-year-old son. "And there are moments when you're a little calmer. ... They are all moments that you wouldn't wish on anyone." MEXICO CITY (Reuters) - An army of trained rescuers and scores of volunteers carefully combed through the rubble of Mexico's most deadly earthquake in decades on Saturday, hoping against diminishing odds to pull more survivors out nearly four days after the disaster struck. "We pray to God they are alive, that they can hold on," the 38-year-old housewife said, her eyes red with exhaustion as she has not slept in days. After several days of searching, rescuers were finding more corpses than survivors, and frustration was mounting especially as the government's efforts were largely panned. Tuesday's massive quake hit on the anniversary of the deadly 1985 tremor that by some estimates killed as many as 10,000 people and destroying scores of older buildings in the Mexican capital. "There are still people alive down there," he said. "For me, it's really satisfying to be here even though it's hard to explain," he said. "There's so much emotion and anxiety." The U.S. Air Force sent a C-17 Globemaster III filled with search-and-rescue teams, disaster relief personnel, and thousands of pounds of supplies and equipment to Mexico City on Wednesday night as the city grapples with its latest earthquake aftermath. Kentucky National Guard flies "airbase in a box" to Puerto Rico. Now we're cookin! There's no timeline on when they'll be coming home. “Just until the mission is done." LOUISVILLE, Ky. (WDRB) – 32 airmen from the Kentucky National Guard left Saturday morning for Puerto Rico with two large C-17 planes. They'll be opening up the airfield so supplies can be flown in. “We essentially bring a base in a box,” Lt. Col. Steven Campbell said. Following weeks of hurricane relief efforts from Hurricane Harvey and then being on alert for Hurricane Irma, the Kentucky National Guard is now fully focused on relief efforts in San Juan, Puerto Rico, after Hurricane Maria. “We'll go in there, we'll set up. We don't need electricity, we don't need running water. We don't need anything. We'll go in and if there's a runway and a ramp, we'll set up an airbase and start bringing in recovery supplies,” Campbell said. While the airmen are preparing the base, volunteers back home in Louisville will be collecting supplies to be shipped there. “Shampoo, toothbrushes, toothpaste, baby diapers, adult diapers for the elderly and water is a very important thing,” Mitch Dennison said. Dennison is one of many in this collection effort. Those items can be dropped off with volunteers loading up a large truck outside the Americana Center on Monday and Tuesday from 8 a.m. to 9 p.m.
Other items being collected include non-perishable food items and rechargeable radios. Dennison says the radios are important for communication. “Because 911 is down in Puerto Rico. There's no electricity, there's no 911, there's no electricity, there's no communication to emergency services,” he said. Many are also using Facebook at times to share pictures of loved ones -- hoping for good news. “You don't know whether to think the worst or to wonder if the person is not there anymore,” Dennison said. Dennison himself was just reunited with friends and family from social media after not hearing from them for several days. A truck full of the Louisville donations will be sent to New York and then to Puerto Rico. As for how long the National Guard will be there -- there's no timeline on when they'll be coming home. “Just until the mission is done,” Campbell said. Organizers are asking for volunteers to help pack the truck before it leaves Wednesday morning, asking volunteers to spare 15 or 20 minutes when dropping off their donated items. The truck will be parked outside the American Center at 4801 Southside Drive in Louisville. "As it often goes in Mexico, it is not the law that is problematic, but rather the implementation." "But the inspection of older buildings can also be lax, which might have been the case in the tragedy at the Enrique Rebsamen School , where 19 children and 6 adults died this past week following the collapse of one of its buildings." "It's like being built on jelly on top of something that is wobbling," Jackson said. The soft sediments were the major cause of damage in Mexico City's 1985 earthquake, according to Cornell University geophysicist Geoffrey Abers. While the soil factor isn't directly connected with the issue of building code enforcement, it adds urgency to the discussion. In fact, the geologic situation for the mega-city makes the lackadaisical inspections there almost beyond belief, particularly after the Kathmandu quake. There is no way that Mexican officials could have been unaware that their city was in the same danger as Kathmandu's. So in my view gross negligence about building inspections in Mexico City, with its megapopulation, is frankly evil. MEXICO CITY — The devastation caused by Tuesday’s earthquake in Mexico City was far less than it might have been, and a fraction of what the city suffered in the quake of 1985. But one main reason had to do with the nature of the earthquake itself and less with the toughened building codes adopted in the last 30 years, as many people had thought. Although the new codes now rank among the world’s best, their enforcement is deeply flawed and uneven, according to interviews with scholars, officials and building inspectors. Building inspections have essentially been outsourced to a network of private engineers who are hired and paid for by the developers, creating conflicts of interest that can undermine even the best standards. Tighter building codes, better construction materials and a robust public awareness surely played a role in limiting the carnage this time around. Fewer than 300 people died and about 40 buildings collapsed, while nearly 4,000 buildings were declared severely damaged and are likely to be uninhabitable, officials have said. But what spared this metropolitan area of 21 million was, at least in part, luck. “They were different seismic activities, in magnitude but especially given the distance,” said Dr. Eduardo Reinoso, a researcher specializing in seismic engineering at the National Autonomous University of Mexico. In a 2016 study of a random sample of 150 buildings constructed after 2004, when the new codes were adopted, Mr. Reinoso found that many failed to meet city standards. In many cases, the buildings reviewed did not even have enough necessary paperwork to conduct a full assessment. As it often goes in Mexico, it is not the law that is problematic, but rather the implementation. Whether because of a lack of political will, the corruption that seethes through the system or the dysfunction of the bureaucracy, one of the deadliest threats that the nation faces has been left unfixed. Once the dust settles, officials will be confronted once more with a choice: whether to truly enforce a public safety imperative or continue with reforms that seem to exist mostly on paper. According to last year’s study, of the buildings that could be fully inspected, 71 percent failed to meet a high threshold of compliance with the city standards, while 36 percent failed to meet even a lower threshold of compliance. “It would appear that the regulator is not performing its duty,” the study concluded. But the inspection of older buildings can also be lax, which might have been the case in the tragedy at the Enrique Rebsamen School , where 19 children and 6 adults died this past week following the collapse of one of its buildings. City code requires that certain buildings, including schools, be inspected for safety after an earthquake. After a massive earthquake hit Mexico on Sept. 7, an inspector was dispatched to the school. The contracted inspector signed off on the structure, deeming it safe, said Claudia Sheinbaum, the local delegate in charge of the district where the school is located. “They came to the school to verify the building and said it was O.K.,” she said. As in many of the recovery efforts, legions of volunteers have raised their hands to help in the building assessments. A patchwork group of engineering groups and nongovernmental organizations have taken to the streets to assess the status of structures whose sagging frames pose dangers to neighboring buildings as well as passers-by. Still, it could have been worse, a message that some in the civil engineering community are hoping to send to Mexico City officials to prompt changes to the conflict-ridden system of building inspections. Mr. Alcocer said that while the system was imperfect, he was pleased with how some larger structures held up under Tuesday’s seismic shudders. But he feared that builders, who often hire the cheapest inspectors to review their buildings and may not follow code, might take the wrong lesson from the earthquake if their buildings did not fall. “In another type of earthquake, we could have problems in buildings that fared well this time,” he said. No two earthquakes are the same, even two that strike in the same seismic region. The 1985 quake and the one on Tuesday occurred in the same subduction zone, an area where one of the earth’s large crustal plates is sliding under another. The 1985 quake, at magnitude 8.1, released about 30 times more energy than Tuesday’s magnitude 7.1 quake. But it also struck twice as far from the capital – 220 miles compared with about 100. There were other differences as well: the 1985 quake was shallower, and even the orientation of the faults — the direction the rocks moved in — was different. All of those factors affected the toll in destroyed buildings — about 350 in 1985 and one-tenth that number on Tuesday — and in deaths. Four days after Tuesday’s quake, the death toll was still climbing, but the final tally will be nowhere near the estimated 10,000 who died in 1985. Generally, a more powerful quake would cause more shaking and greater destruction. Being farther away would tend to reduce the impact. But in the case of the 1985 earthquake, the larger distance from the epicenter played a critical role in which buildings were damaged and destroyed, and in the death toll as well. After that quake, engineers noticed a pattern to the destruction. Of the hundreds of buildings that collapsed or were heavily damaged, most were six to 16 stories tall. The reason soon became apparent. High-frequency waves of energy generated by the quake dissipated over the miles to Mexico City, leaving mostly low-frequency waves to reach the capital. It’s similar to how, when listening to far-off music, treble sounds tend to be absorbed and only bass sounds reach the ear. During the earthquake, those lower-frequency waves rolled through the city about one second apart. That closely matches the natural resonance, or rate of vibration, of buildings about 60 to 160 feet tall. Successive waves caused those buildings to sway more and more. The soft sediments that the city is built on, which tend to amplify movements, made the swaying even worse until the structures failed. In the quake on Tuesday, however, “there wasn’t as much distance for that higher frequency energy to be absorbed,” said Gavin Hayes, a geophysicist with the United States Geological Survey. As more of these shorter, faster waves reached the city, smaller buildings vibrated until failure. Taller buildings were generally spared this time. Since smaller buildings hold fewer people, that helped keep the death toll down. But not all larger buildings were spared. In an area called Portales Sur, which sits on the fringe of the rapidly gentrifying neighborhood of Narvarte, buildings have sprung up in recent years for young professionals looking to own their first home in the city. The builder of a six-story condominium completed this year promised the latest in technology and design – apartments constructed of concrete and steel-draped elegance. Rainwater cisterns fed eco-friendly plumbing, while solar panels stationed by the rooftop garden powered units that sold for about $150,000. The building collapsed on Tuesday, taking with it the lives of two people. Now, its remains sit in a pile of twisted metal and fractured concrete, testament to the often-shoddy construction and lax inspections that helped clear the way for a voracious real estate boom in the capital, according to experts and officials. Residents are searching for legal recourse, given the failure of inspectors to detect or report the structural flaws. They have to. Many did not have property insurance, as few people do in Mexico, and the developer has claimed the quake was unforeseeable, raising fears among the unit owners that the company may try to abdicate responsibility. Azam Ahmed and Marina Franco reported from Mexico City, and Henry Fountain from New York. Elisabeth Malkin contributed reporting from Mexico City. "Threat from Hurricane Maria to U.S. coast is increasing"
"Maria’s wind field has been gradually expanding ... Maria has been successfully fending off moderately strong wind shear of around 15 knots with the help of its well-established structure as well as very warm sea surface temperatures ..."
Still a Category 3 storm on Saturday, Hurricane Maria was rolling northward away from the Bahamas on a path that could affect parts of the U.S. East Coast next week. 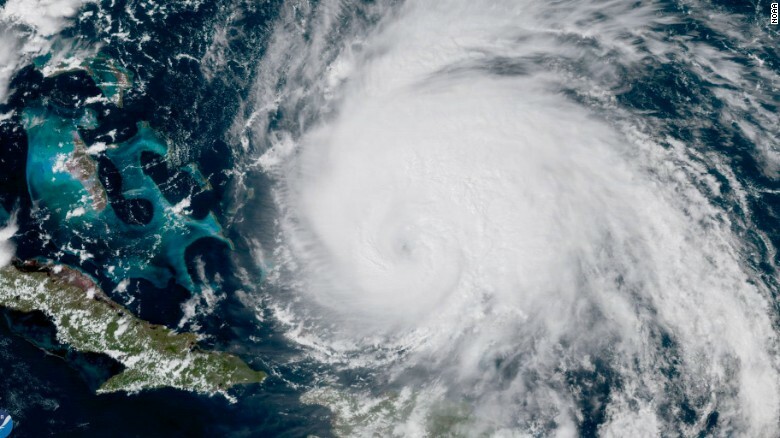 Maria pummeled the Turks and Caicos Islands early Friday, its western eyewall passing over the capital city of Cockburn Town. For the first time in several days, Maria poses no immediate threat to land. At 11 am EDT Saturday, Maria was located about 320 miles east of Nassau, The Bahamas, moving north-northwest at 8 mph. Maria’s top sustained winds had dropped to 115 mph, putting it at the low end of the Category 3 range. Maria was not a classically symmetric hurricane on Friday night, but its appearance on satellite had become dramatically stronger by midday Saturday. Very strong thunderstorms (convection) were wrapping around Maria’s ragged, 35-mile-wide eye. As is typically the case for hurricanes moving poleward, Maria’s wind field has been gradually expanding. Hurricane-force winds now extend up to 60 miles from Maria’s center, with tropical-storm-force winds extending out some 200 miles to the northeast of the center. Maria has been successfully fending off moderately strong wind shear of around 15 knots, with the help of its well-established structure as well as very warm sea surface temperatures (SSTs) of 29-30°C (84-86°F). Maria will continue to traverse very warm water over the weekend, with oceanic heat content high enough to reduce the chance of cooler water being upwelled. Wind shear will drop to around 10 knots, which together with the warm water will help give Maria a bump-up in strength, perhaps to the high-end Cat 3 or low-end Cat 4 range. As time goes by, greater parts of the circulation will be passing over the wake of cooler water left by Jose. This should produce a gradual weakening trend, although Maria is still expected to be a Category 1 hurricane on Thursday. Wind shear should be around 10 – 15 knots for most of next week, which is moderately strong but not enough to destroy a well-organized hurricane like Maria. If Maria’s path continues trending westward, it will keep more of the circulation over the warm Gulf Stream waters and away from Jose’s wake, which would help Maria to maintain more of its intensity. Regardless of Maria’s exact track, the hurricane is sure to bring a long period of increasing swells, dangerous surf, and rip currents to the Southeast U.S. coast, extending to the mid-Atlantic later next week. Significant beach erosion can be expected in and near the Outer Banks, given Maria’s strength and slow movement. There will also be an increasing chance of tropical-storm-force winds across parts of the U.S. East Coast by midweek (see Figure 4). Plenty more in the report, which Weather Underground's Dr Jeff Masters contributed to. The Governor's visit was yesterday; this morning New York City also sent an official delegation to Puerto Rico; see the following report for details. 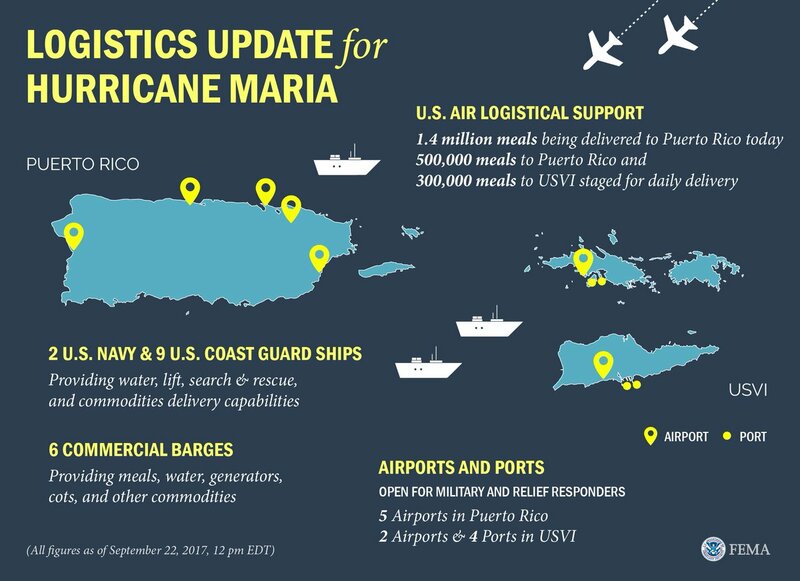 While the Governor's delegation brought supplies, troops, and even helicopters, this is virtually nothing next to what is needed. And I am surprised that the NYC delegation arrived only with an offer of help and not with any supplies in tow. Or if they did bring supplies, this wasn't noted in the Gothamist report. ... Governor Cuomo has announced that 60 members of the New York Army National Guard, four Black Hawk helicopters and 50 State Police are on standby. After surveying the destruction caused by Hurricane Maria in Puerto Rico on Friday, Governor Andrew Cuomo said that "in person it is much worse than it appears on the TV reports." "The devastation of the island is really breathtaking," continued Cuomo, who held a press conference shortly after a delegation of officials who visited the island with him landed in JFK. "There are parts of the island that have as much as seven to eight feet of water in homes." Cuomo went to Puerto Rico in response to an official request for assistance and aid from Governor Ricardo Rossello. The delegation brought 34,000 bottles of water, 9,600 ready-to-eat meals, 3,000 canned goods, 500 flashlights, 1,400 cots, 1,400 blankets, 1,400 pillows and 10 10kW generators. The supplies and the delegation arrived via an aircraft donated by JetBlue. "The one thing that's clear is these people need a lot of help. And we have to remember that they're American citizens. It's Puerto Rico, they're American citizens. U.S. Virgin Islands, they're American citizens," he said. Cuomo was joined by 60 members of the National Guard, emergency management officials, Representative Nydia Velazquez and Assembly Member Marcos Crespo. Crespo, like so many others who haven't been able to reach their loved ones, wasn't able to visit the town where his mother lives during the visit because it was so "battered and flooded," according to the New York Post. "While I didn't get to see mommy, I have hope," Crespo told the Post. "I don't know much about my town today, as I did before this trip. But I know the donations Puerto Ricans have received are going to help where it matters the most." And this morning, Council Speaker Melissa Mark-Viverito and 22 city workers flew to San Juan, Puerto Rico. Among the city workers are 10 emergency managers, nine members of the NYPD Hispanic Society, two staffers from Department of Buildings, and a staffer from the Mayor's Community Affairs Unit. "We're ready to do all we can to help those affected by this devastating hurricane," Mayor de Blasio said in a statement. "We thank the Hispanic Federation for making this flight possible and these responders for dedicating their time and expertise to assisting with recovery." For a list of organizations collecting money and goods for the hurricane recovery effort, click here.